A commercially funded science expedition sets out to the bottom of the Marianas Trench to prove whether or not a deeper section of the ocean exists. It does – and furthermore it is populated by a previously undiscovered ecosystem, included the presumed-extinct prehistoric giant shark known as megalodon. The expedition is attacked and escapes; however, the “meg” follows its prey to the surface and becomes a deadly threat to humanity. 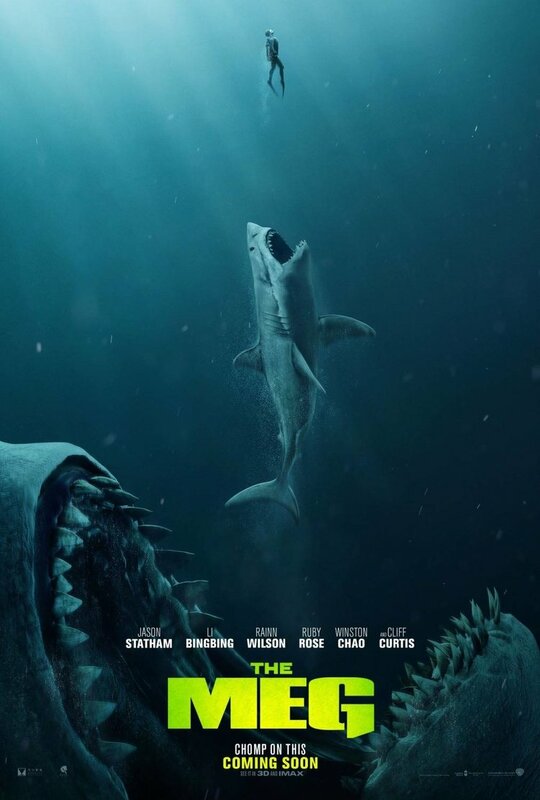 The Meg is a Chinese-American co-production, one directed by Jon Turteltaub and based loosely on the potboiler novel by Steve Alten. The film spent something like two decades in development hell before emerging in its finished form: a trite and obvious blend of action-thriller and disaster movie. Giant or otherwise, there is only so much creative ground to cover with a shark-based thriller. The Meg tries to have it a few ways: its early scenes offer a short revisit of James Cameron’s The Abyss before making a sharp segue into Renny Harlin’s somewhat less prestigious Deep Blue Sea. Once the research base is shut down and abandoned, the film adopts the angry fisher-people-versus-shark thrills of Steven Spielberg’s Jaws for its second half. Now there was no chance of The Meg matching the quality of Jaws, which remains one of the best motion picture thrillers of all time, but it does not even manage to approach the cheesy amusement of Deep Blue Sea. Turteltaub is a career-long mediocre director, with a resume including the likes of Phenomenon, While You Were Sleeping, Instinct, and National Treasure. The Meg falls right in the middle of the pack: it is watchable, but it is also not actually good enough to recommend to anybody. At the same time it is not bad enough to enjoy mocking. You can enjoy yourself watching The Meg, but only to a degree – and not a large one at that. Jason Statham plays a very broadly drawn and generic version of the sort of character he plays all of the time. Gruff, British, and edgy, he growls and frowns his way through a string of chase and action scenes. Sometimes he’s behind the controls of a Gerry Anderson-style submersible, and other times he simply swims for his life in the open ocean. It is the kind of action Statham can do running on automatic, but to his credit he does put in a modicum of effort. The same is true of co-star Li Bingbing, who places a fair level of charisma into a relatively boring character, and Rainn Wilson, who overacts amiably as a billionaire benefactor to the research team. It is no exaggeration to claim Li, Wilson and Statham largely carry the film. They at a minimum make the tedious watchable. Other members of the cast, including Cliff Curtis, Ruby Rose, and Winston Chao, don’t provide anywhere close to as much entertainment value. One of the more interesting elements of the film is its status as a Chinese-American co-production. It seems to deliver the more stereotypical elements of both industries. The characters perform in very American ways, until they suddenly feel very generically Chinese. The film’s climax heads in a particularly Chinese direction, until it reflexively switches back to feeling American. The haphazard tone and style ultimately does a lot more harm than good, but it will be interesting to see how this shared aesthetic plays out in future co-productions. The megalodon itself has a cartoon-like appeal. Despite being based on a real animal, its sheer scale makes it feel unintentionally funny. Not that the scale feels consistent. Through its various action sequences its size seems to shift up and down based upon the whims of the story. In the deep ocean it gets some visual effectiveness. When marauding the coast of a Chinese holiday resort it simply feels a bit goofy. Films of these nature tend to succeed based on powerful and inventive action set-ups, and The Meg unfortunately fails to find much inventive material at all. There will always be a broad market for these kinds of generic blockbusters – the half-billion grossed by this film demonstrates that ably – but there will always be better and more enjoyable films to see. My advice is to seek them out instead. I want a movie about a giant shark that is not a horror/thriller. This will never happen but I love the idea of watching a giant shark on screen, but not watching it be a monster killer thing. I am sure I’m in the minority. This is also how I feel about the Kraken – I want a story from the misunderstood monster’s pov. “They at a minimum make the tedious watchable.” OUCH. Still, I suppose this shows that the actors deserve some respect even if the film they’re trapped in doesn’t.